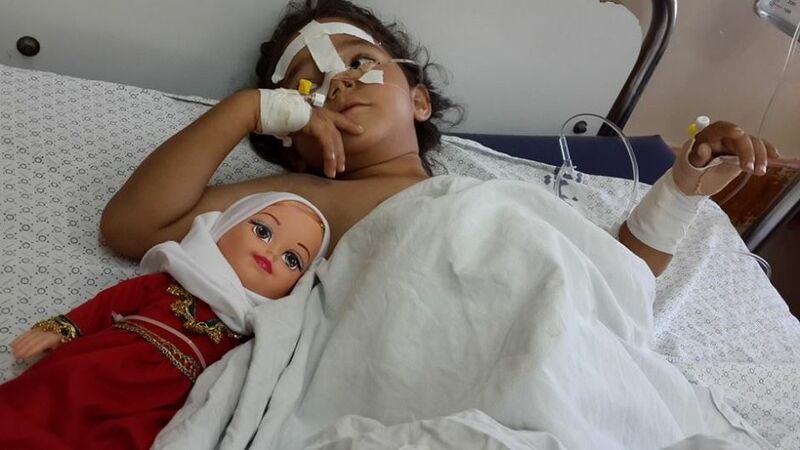 A Palestinian girl sustained moderate injuries when Israeli warplanes bombed her house, killing most of her family members. Gaza, ALRAY - The Euro-Mid Observer for Human Rights, based in Geneva, affirmed on a statement published on Friday that the Israeli attacks against the Gaza Strip are escalating with an aerial strike, against different areas across the Strip, every three minutes. Euro-Mid confirms that the Israeli forces continued their attack with increased bombing on civilian facilities and stepped up the targeting of civilians, women and children in particular, and the bombing of houses continues exponentially. According to the statement the Israeli warplanes targeted an entire family at dawn on Friday 11 July 2014 by bombing their home without previous warning. Five members of the Ghannam family in Rafah, in the south of the Gaza Strip, have been killed in the attack, including a 7 years old child. The charred bodies and body parts of the victims arrived at the hospital, including 15 injured family members and neighbors, some of them in critical condition, including children. Palestinian rescue teams have searched for hours for survivors or casualties under the rubble of the destroyed house. "Euro-Mid noted a significant increase in the targeting of civilian institutions by the Israeli army on the fourth day of the attack. The Israeli forces have targeted the Salah school in Deir al-Balah, a water pipeline that supplies more than 20,000 Gazans in the Zaytoun area and a wastewater treatment plant. Furthermore the Israeli forces targeted a car belonging to the municipality of Bureij refugee camp, killing two and wounding several. Israeli has also targeted power lines in Gaza city, Rafah and northern Gaza, leading to a power loss of 45 MW," the statement added. According to the statics of the Euro-Med , the number of victims on the fourth day is 21 people, including 16 civilian men, 3 children and 2 women. The total number of casualties reaches 103, of when 23 children and 12 women. The number of wounded on Friday 11 July is 163 wounded, including 58 children, 38 women and 79 civilian men. Their injuries range from serious to minor. This brings the total number of casualties since the beginning of the Israel attack to 796 wounded, of which 263 children, 125 women and 408 civilian men. Euro-Mid documented 527 missile strikes, of which 89 naval strikes, 314 airstrikes and 124 artillery shells. The total number of Israeli attacks on the Gaza Strip since the beginning of the Israeli military operation has increased dramatically, reaching until midnight Friday 11 July 2014, 2161 missiles. On Friday 11 July, 305 homes have been damaged of which 36 houses have been completely destroyed; bringing up the total number of damaged houses since the beginning of the attacks to 894.